We often hear complaints that there are no longer any bargains in the world. Canadian Bottle and Stoneware Collector magazine is the exception to that rule! Yes, for only $22.50 per year, our subscribers receive 4 Issues of the magazine that author Jack Sullivan has called, "top of my list of the best layouts I have ever seen for a bottle mag - and if it is published in English, I get it." 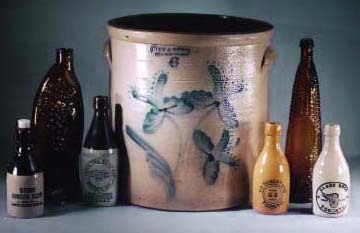 And Mike Sheridan, editor of Britain's superb publication Bottles & Bygones, praised the new Canadian Bottle and Stoneware Collector by writing, "The layout and quality of the photographs is out of this world. There are some really excellent articles to read and the centre page is breathtaking. Peter Austin has set new standards for publishers of Collector Magazines all around the world!" Recent features in the magazine included a special report on "Canada's Top 10 Bottles", a fascinating article on the rediscovery of 1770 Canadian medicine bottles used by the Jesuits in early Quebec, and a special feature on Toronto's famous soda water bottler J. J. McLaughlin. Also excellent articles on medicines, ink bottles, insulators, ginger beers, fruit jars, milk bottles, digging reports, features on stoneware & pottery, and as usual, much much more! Every Issue is packed with numerous articles, excellent writing, supported by dozens of photographs of remarkable bottles, stoneware, advertising and collectibles! Each issue of Canadian Bottle and Stoneware Collector is the result of hundreds of hours of dedicated research, writing, and production by dozens of talented people.Their shared goal and vision is to publish a superior bottle magazine, unlike no other! We would like to invite you to join our readership. and, it's the ONLY magazine you can not afford to be without!